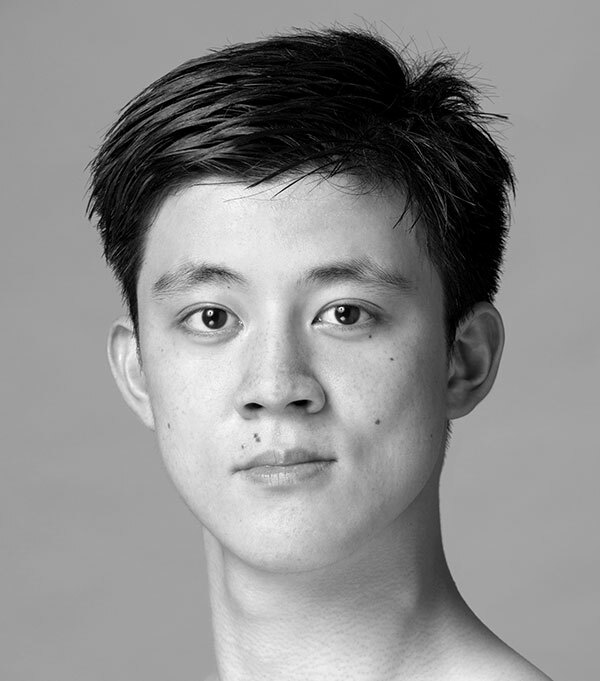 Mingxuan Wang has danced featured roles in Tomasson’s Giselle (Peasant pas de cinq), Haffner Symphony (soloist), Nutcracker (Jack-in-the-Box, King of the Snow, Spanish, Arabian, Chinese, and Russian), Romeo & Juliet (Acrobats), The Sleeping Beauty (Suitors and Pas de Six/Cavaliers), and Swan Lake (Aristocrats); Tomasson/Possokhov’s Don Quixote (Toreadors); Balanchine’s Diamonds (soloist) and Theme and Variations (soloist); and Wheeldon’s Cinderella (Fates). His repertory includes Balanchine’s Allegro Brillante, Coppélia, Prodigal Son, Serenade, and Stravinsky Violin Concerto; Bubeníček’s Fragile Vessels; Cranko’s Onegin; Lifar’s Suite en Blanc; Pita’s Salome (Guards); Possokhov’s Firebird, Optimistic Tragedy, and Swimmer; Ratmansky’s Shostakovich Trilogy (Symphony #9); Robbins’ Glass Pieces; Scarlett’s Frankenstein and Hummingbird; and Tomasson’s Caprice, The Fifth Season, Prism, and Trio. Mingxuan won the Junior 1st prize at the Seoul International Dance Competition in 2013 and was a finalist at the Prix de Lausanne International Ballet Competition in 2012.